So let's start at the beginning: GMA is a Sunday to Wednesday convention built around the Gospel Music Association's Dove Awards on the Wednesday night. The event draws Christian music artists, labels, radio, print media, unsigned bands looking for exposure, music business pros, etc. We all stay in two hotels about 2 blocks from each other in downtown Nashville. There's seminars, music showcases, and lots of schmoozing. This year at GMA seemed a lot more mellow than in years past. Maybe there were less people there? There just seemed to be a different vibe. Nonetheless, it was fun. I interviewed new artists Two Empty Chairs and Nate Huss to start the day. Then, Russ and I double-teamed an interview with the Desperation Band, the worship band at New Life Church--the church that belonged to Ted Haggard. We talked about moving on when leaders fall. I mentioned when I blogged earlier this week that Jim Caviezel showed up. When I was leaving the Desperation Band interview, one of the guys was like, "I just got a text. Jim Caviezel is downstairs!" We all went and looked. He was in the little bar section of the hotel doing a meet and greet. Jesus in a bar? Funny. I had a full day of interviews. The best ones were with Seventh Day Slumber's bassist, Chris Tomlin, tobyMac, and rapper Pettidee. Pettidee wears grillz. I've never talked to a person with a grill. Or been hugged by one. So that made my day. The worst part of the day was that I had interviews all scheduled back-to-back. And so I rushed around a lot. I was running late for Tomlin and was stuck on the 23rd floor of the main hotel for GMA. The elevators are infamously busy, slow and jammed at GMA, so I took the stairs. Later, I was in a hurry again and needed to go from floor one to the 19th floor. I thought, I did 23 floors by stairs earlier. Surely, I can do 19. Well, going up is different than down. I did my entire interview with Group 1 Crew sucking air. Listening to that tape has to be really funny. I don't even know if the pic does it justice. It's HUGE. You can see that one member of the band is also taking a picture of it. In fact, as soon as it came, we all pulled out our cameras. 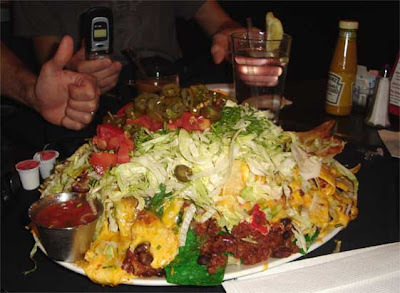 The nachos were so good, you can see one band member giving it the thumbs up. See how small his hand is in comparison to the heap of goodness? Wow. My day of interviews ended with Connersvine, a worship group releasing an album in September. One member of the band is Hunter Smith, punter for the Colts. He wasn't there because he was visiting the White House with the team. But I told the other member, Chris, that I was very skeptical of the band because I am a Bears fan. He responded by saying that he's not a football fan at all so he's objective. In fact, he said that when he first started playing with Hunter in church, he didn't know what Hunter's day job was. The only show I saw that night was The Afters. I tried to see an acoustic show by Switchfoot's Jon Foreman, but the line was BLOCKS long. TUESDAYAt 8:00, I started my day with Flatfoot 56, the celtic punk band from Chicago I really dig. It was fun. They weren't too awake but I got in good with them because I'm a Sox fan. 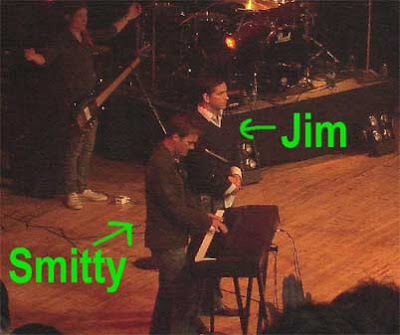 I also interviewed Michael W. Smith, Jars of Clay, Red and Adie. The whole afternoon was taken by a Word Label meet and greet. For four hours I was at the Melting Pot fondue restaurant doing a kind-of speed dating set up. Every 10 minutes, the journalist would rotate to the next artist. The most fun I had was with Big Daddy Weave who goes down as the only artist at GMA to say the words "kick him in the nuts" and Stellar Kart who dared a 14-year-old member of another band to eat a potato straight out of the hot oil. It was hilarious. Two of the bands were late because a hotel elevator got stuck. 16 people had crammed in it and it bottomed out on the first floor. They were in there for 30 minutes. "You could see the condensation and sweat running down the walls," one guy told me. 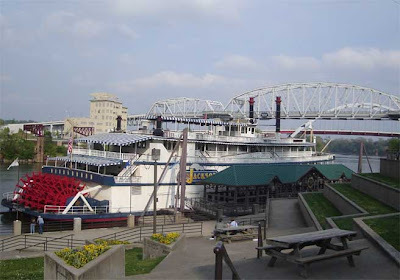 Right after the Fun-do, I went on a Provident Record Label boat cruise. I was seated at a table right in front of the stage for the dinner and show. Every table has an artist at these media dinners. Our artist was the lead singer of Pillar. So that was cool. Four or five bands perfromed. 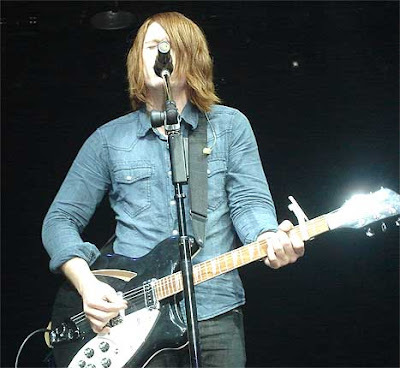 The one I liked the most was Leeland. 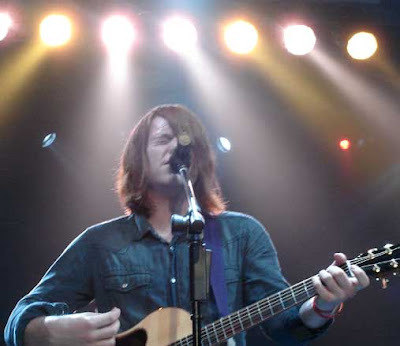 Because I was so close to the stage, I couldn't help taking a couple pics of Leeland. My appreciation for this young band really has taken off after intervieiwing them Tuesday morning and seeing them play live. It's good stuff. My GMA was capped off by the Provident-Flicker rock show Tuesday night: Flatfoot 56, Red, Wavorly, Pillar and Nevertheless. Flatfoot was awesome but the crowd wouldn't get crazy enough for them. And I really think my Band To Watch this year is Wavorly. I'd heard their album before GMA, but seeing them live really impressed me. They do this dramatic hard rock that's just solid. It seemed like the crowd really dug them. And so, that's my GMA 2007. You always come back from GMA week with such great food stories. It's a wonder more Christian artists don't have weight problems! Haha. Way to take ownership, C-Dog. And yah, GMA is all about the food for me. I once got a peice of Carrot Cake at GMA that was bigger than my head. Literally.